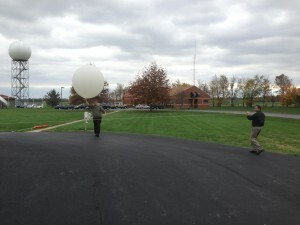 The National Weather Service Office (USA) in Springfield along with all other offices equipped with the Upper Air Program around the county will be releasing additional weather balloons during the next several days to help track Hurricane Sandy and the evolution of this potentially dangerous storm affecting the East Coast. Starting today, offices will release four weather balloons per day instead of two. The extra balloons will help computer models develop a consensus on the eventual track and fine tune the forecast of the storm that may strike the northeastern United States early next week. The Springfield NWS office normally releases balloons each day at 6 a.m. and 6 p.m. The additional balloons will be released daily at 12 p.m. and 12 a.m. through at least Tuesday. Below is a picture of the first special release at noon Thursday conducted by our Electronic Technician, Quay Kendrick and our IT Specialist, Mike Sutton.